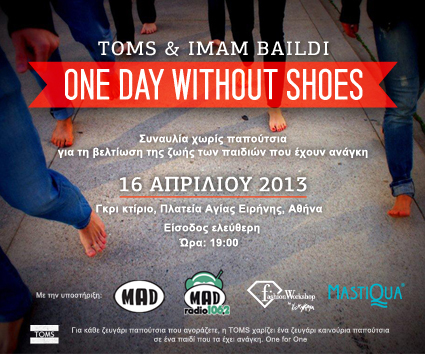 TOMS and Imam Baildi invite you to a barefoot concert for the One Day Without Shoes on the 16th of April, at the Grey building at Agia Eirini square in Athens at 7 p.m.
TOMS One-for-one initiative is to improve the lives of children in need. The event One Day Without Shoes is a global movement that aims to inform and sensitize the world practice improving the lives of poor children. It is a day on which we make our shoes to raise awareness of those around us about the importance of which can have a pair of shoes to a child's life. On the same day all over the world, people organize events without wearing shoes and inform why shoes are important for a better tomorrow. Millions of children are at risk of injury and infection from diseases transmitted from the ground. There are countries where shoes are necessary to enable children to go to school. Children who are in good health are more likely to be able to be good students. Personalities such as Lenny Kravitz, Charlize Theron, Demi Moore, Jay Leno, Heather Graham, Donna Karan, Arianna Huffington and Tory Burch support and participate in One Day Without Shoes. For every pair purchased, TOMS gives a pair of new shoes one to a child in need. One for One. 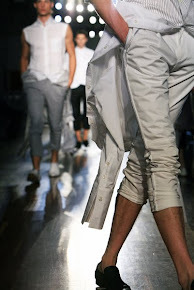 The concert is with the support of: MAD, MAD Radio 106.2, Fashion Workshop by Vicky Kaya, Mastiqua . See also my report on One day without shoes in 2012 and here of the event.